Making a big splash on the eve of PirateFest 2011, the Buccos have reached a deal with Duquesne U. product and former Pirate pitcher Joe Beimel, who will sign with the team today. 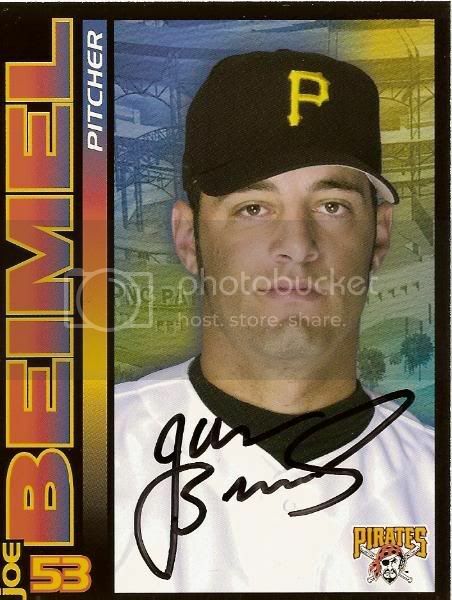 After pitching with the Pirates in middle relief from 2001-2003, Beimel has also pitched for Minnesota, Tampa Bay, the Los Angeles Dodgers, Washington, and Colorado. He holds a career mark of 23-31 with an ERA of 4.16 and will fill a need for lefty relievers in the Pirate pen. Terms of the deal have not been made public yet, but for comparison's sake, Beimel made $850K with the Rockies last season. So the deal probably won't break the bank. All fans get a 2011 Wall Calendar, Pocket Schedule and PirateFest Program. "Lost Treasures" area with game-used jerseys, bats, balls and more for sale. A charity silent auction with proceeds to benefit Pirates Charities. Inflatable rides, batting cages and carnival games. New contests like "We Are Fam-A-Lee Feud" and "Minute To Win It"
Please try and curb your excitement.